In the vintage era a relish was any kind of side item with a sour or sour sweet taste. This term usually applied to pickles, chutney, piccalilli, etc. We have changed the meaning in the modern era to mean chopped pickles added to hot dogs or various salads. It was not uncommon to have a dill pickle with dinner as such practices were thought to aid in digestion which has some foundation in fact if the pickles are lacto fermented. 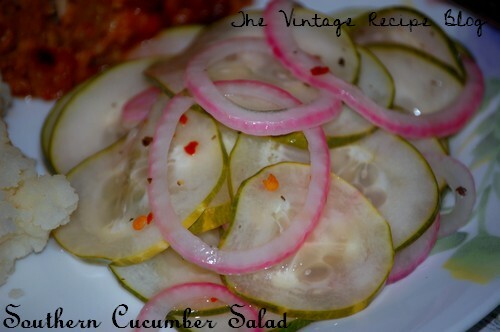 In this case I am sharing a family recipe for Cucumber Salad, a dish most often served with pork but I eat it with just about anything (ok not ice cream). It's simple to make and tastes better the day after it's made so the flavors can meld together. The last time I made it I stuck with organic cucumbers and it just tasted divine. You don't need to use any special vinegar with it, just plain white vinegar will do fine. I use a V-cut (mandoline) slicer to thinly slice the cucumbers and onion. In your container layer the cucumbers alternating with the onion finishing with onion on top. In a saucepan over med heat combine the rest of the ingredients and heat, stirring occasionally, until the sugar is melted in. Remove from heat and let cool 10 mins before pouring over cucumbers and onions. Cover and refrigerate one day before eating. Will last up to a week in the fridge.